I’m currently in wonderful, Chapel Hill, North Carolina for the 30th annual North Carolina Recreational Therapy Association (NCRTA) conference. 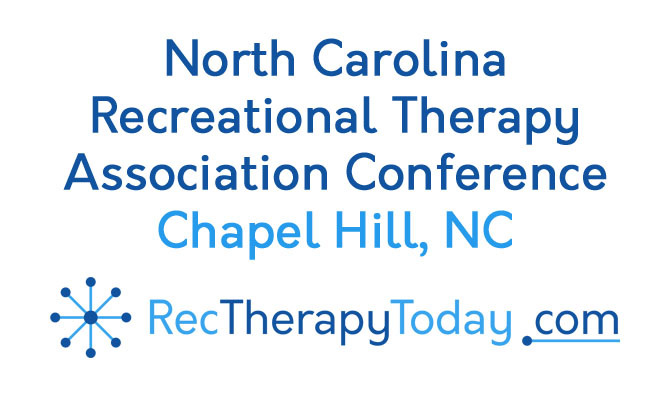 My site, Rec Therapy Today is a sponsor for the the 2018 NCRTA conference! Here is my current lineup of sessions that I’ll be attending. I’ll be posting reviews and evaluations my blog over the next few days. 8:00 a.m. until 9:30 a.m. North Carolina Board of Recreational Therapy Licensure (has traveled far this year, come to hear the changes with my good friend and fellow native West Virginian, Becky Garrett. 9:45 a.m. until 11:15 a.m. I’ll be presenting Evidenced based outcomes for self-expression in recreational therapy. 1245 p.m. until 2:45 p.m. Keynote Session: Recreational Therapy: health and well being on patient outcomes and ways of improvement with Jessica Hauser. And then I’m headed back to good ol’ West Virginia.